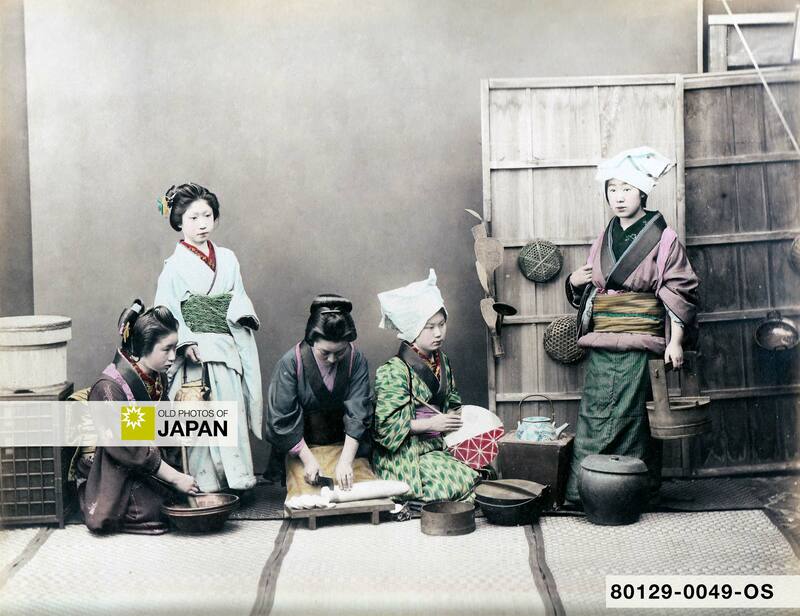 In this dramatized studio photograph of five women, the photographer has attempted to show how Japanese meals were prepared in late 19th century Japan. They are surrounded by a variety of traditional Japanese kitchen tools. The woman on the left is grinding sesame seeds or mashing miso in an earthenware suribachi (すり鉢, mortar). The woman standing next to her is holding a kettle for boiling water. The woman in the middle is slicing daikon on a wooden mainata (まな板) cutting board. The woman next to her is apparently fanning a coal fire in a hibachi (火鉢), heating a pot of tea. The woman standing on the right is carrying a teoke (手桶), a wooden bucket with a handle. Two women are wearing hokkaburi (頬っ被り) headwear. Japanese hairstyles were extremely elaborate and contained a lot of wax. Housewives and working women used the hokkaburi to protect their hair from dust and dirt while working. Usually tenugui (手拭い) were used. You can also licence this image online: 80129-0049 @ MeijiShowa.com.